Explore, Learn, Have Fun! : Spring FUN Break at Stone Mountain Park! Stone Mountain Park , Georgia’s No. 1 attraction, extends its Spring FUN Break event to two weeks of family-friendly shows and entertaining attractions to accommodate metro Atlanta school Spring Break calendars. Spring FUN Break (SFB) begins the adventure with Journey 2: The Mysterious Island – The 4-D Experience. The 12-minute sequel to Journey to the Center of the Earth engages guests through a 3-D film featuring spectacular 4-D special effects. Sean Anderson (Josh Hutcherson) partners with his mom's husband (Dwayne “The Rock” Johnson) on a mission to find his grandfather (Michael Caine), who is thought to be missing on a mythical island. Together with a helicopter pilot (Luis Guzman) and his beautiful daughter (Vanessa Hudgens), they embark on an amazing voyage and find incredible beauty amidst grave danger. Another new beginning at SFB is the opening of Campfire Grill. Half dining experience and half adventure, Campfire Grill embarks guests onto a camping trip where diners can hear the rustle of the woodland creatures, spot the soft glow of fireflies and almost feel the warmth from the campfire effects. At Campfire Grill, tables are called campsites, guests are campers and servers are camp counselors. “Campers” are tempted with signature menu items such as Campfire Skewers, Coca-Cola®Infused Ribs and warm Brownie S’Mores. The littlest campers can explore the paw prints on the tables and floors and create their own animal track crayon rubbings. Returning to SFB is the popular Wildlife Wonders’ Animal Babies show. From a baby otter to kangaroo and bunnies, animal experts immerse guests in an educational and interactive animal encounter. After the show, kids can ask the animal experts questions and even touch some of the animals. The Wake the Bear improv show also returns to SFB. Families in the audience steer the on-stage action when campers return to base camp only to realize it has become a favorite napping spot for a bear. The campers recruit the audience to help them drive the bear away and regain their campsite. Plus, kids won’t want to miss April Fool’s Wacky Wonderland. The Easter Bunny and the April Fool teamed up to offer a dance party, crafts and other spring-time activities. The Easter Bunny will make appearances during the full two weeks of the SFB event. Also, younger spring breakers will love to clap and laugh along with a fearless adventurer as he tells of the remarkable expeditions during Adventure Tales storytelling. Stone Mountain Park’s Adventure Pass guarantees a full day of fun with access to all of the Spring FUN Break activities plus all of Stone Mountain Park’s attractions such as the new Journey 2: The Mysterious Island – The 4-D Experience, Geyser Towers®, Sky Hike®, the Summit Skyride, the Great Locomotive Chase Adventure Golf, The Great Barn®, Scenic Railroad, the Antebellum Plantation & Farmyard and Memorial Hall Museum. Families may conclude the day with the Lasershow Spectacular in Mountainvision®. 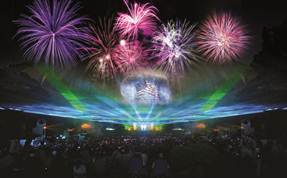 The Lasershow will be featured nightly during Spring FUN Break, March 30 - April 13 at 8:30 p.m.
Stone Mountain Park offers a variety of value-priced options for families to enjoy the park and the special SFB activities. Plantation & Farmyard and Memorial Hall Museum. year to take advantage of the park’s attractions, special events and exclusive discounts. $125 for a family of four (tax not included). and complimentary cups with unlimited refills all day. Families may also enjoy great vacation and staycation accommodations right inside the Park at two Marriott hotels. Family Escape Packages, beginning at $189 a night, include a one-night stay at the Evergreen Marriott Conference Resort or Stone Mountain Inn, 2-day Adventure Passes and breakfast. Listed in Frommer’s 500 Places to Visit with Your Kids Before They Grow Up and cited by the Atlanta Journal-Constitution as one of “35 Natural Wonders in Georgia You Must See”, Stone Mountain Park is located 16 miles east of downtown Atlanta. To get to the park, take I-285 to Exit 39B, Hwy. 78 East. Stone Mountain Park is Exit 8 on Hwy. 78. More information on Spring FUN Break, Stone Mountain Park attractions and hours of operation is available at www.stonemountainpark.com or by calling 770-498-5690. Sounds like a blast, doesn't it!! Hope to see you there over Spring Break! !